It’s been a Long. Hard. Winter. Spring is about to officially debut here in Wisconsin and not a minute too soon. Although that is indeed what our calendars are saying, I’m not buying it; not yet anyway. Last night’s fresh snow fall makes this mid-March day seem more like Christmas Eve rather than the day before spring’s start. Fortunately, in our kitchen, we have the opportunity to create our own warmth and our own season. Here on Platter Talk, we decided to green things up considerably, add a splash of yellow, and just for good measure, a fork full of pure deliciousness. This past weekend we had some new and very fun friends over for pizza, it was mighty fine – let me just say. I put together a pizza that I had not made in a few years, one that featured the granddaddy of all mushrooms, the luscious and stately portabella. You are probably wondering what out little pizza fete from this past weekend has to do with this dish – it was those portabella mushrooms! I couldn’t get them out of my mind, and in my head, I was envisioning all sorts of additional ways to enjoy them, aside from the top of our delicious homemade pizza dough. You may recall that a few weeks ago I did a post featuring Swiss chard and baked eggs. Shortly later, I did something else with eggs, but they were poached with some crispy quinoa and beautiful asparagus. Somehow in my thought process for this dish, the central concepts of those previous posts commingled – and voila! A new idea, sort of. I’ve never worked with kale, and I’m not sure I had even tasted it. Surely I’m one of the last folks on the planet to be able to say that. Eggs are popping up in all sorts of places, these days! 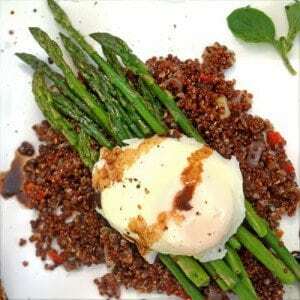 Be sure to take a look at our Poached Egg over Asparagus and Crispy Quinoa. That was the question going through this little head of mine. “Sounds pretty, sounds delicious, and would be made even better if garnished with some fresh oregano and salsa,” I answered myself. “But I’ve never had this or heard of such a thing,” the voice in my head continued. “What do you have to lose?” I retorted to myself. “Maybe a couple of unwanted calories, possibly a little extra around my waist, and just a small amount of culinary dignity if it flops (which no one has to know about,)” I countered. I was starting to convince myself that this could be done. By this point, you probably figured out how this scenario concluded. I did put my idea together. It was delicious; it was healthy. 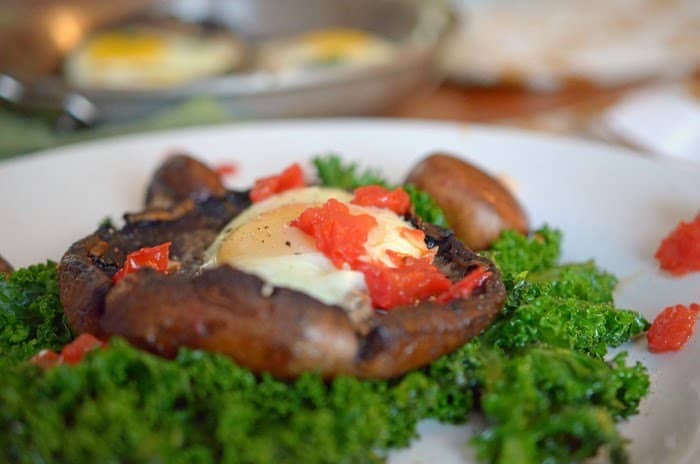 The portabellas added an element of meaty substance while the kale gave it a fresh and bountiful bed of color and nutrition. The egg with its soft yoke and fresh flavor brought the whole dish together. In spite of the persistent low temperatures here and remnants of snow on the ground, this dinner brought a few moments of spring to our kitchen table and offered assurance that indeed there is a light at the end of this winter’s long, cold tunnel. This was delicious, and I hope you will give it a try! 2 cups firmly packed torn and stemmed kale pieces, washed and rinsed. 1 Roma tomato seeded and coarsely diced. Stem and gently scrape gills from portabella caps taking care not to puncture. Using oven-safe saute pan, heat 1 tablespoon olive oil over medium heat. Gently saute the portabella caps for about 2 minutes on each side, until surface darkens and becomes soft, finishing with each cap resting on its back. Crack eggs, individually, into small bowl. Gently transfer eggs to portabella caps, one egg per cap. 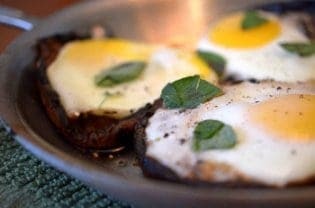 Place saute pan in oven for 12-15 minutes or until eggs are done. In small saute pan, heat 1/2 tablespoon olive oil. Add tomato and garlic, gently saute, stirring occasionally. Cook until soft and garlic is translucent. Place in small bowl, cover and set aside. In small saute pan, heat 1/2 tablespoon olive oil and gently saute baby portabella mushrooms until soft. Cover and set aside. Braise kale by heating broth over medium high heat. Add kale, stir occasionally and cook for 8 to 10 minutes, adding vinegar at the end. 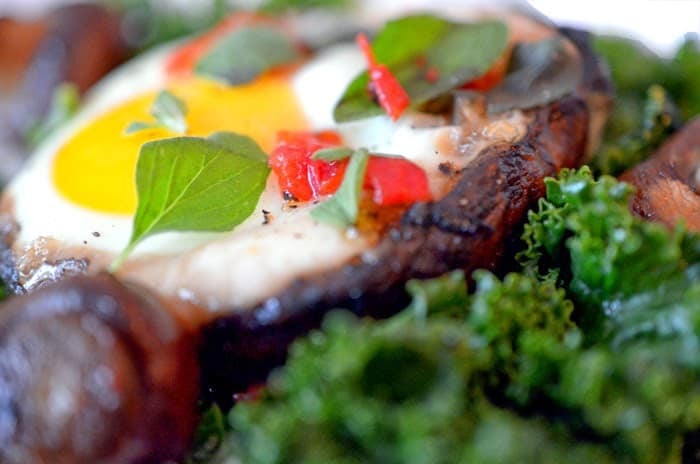 Remove from heat, plate and place baked mushrooms and eggs on top. Garnish with tomato and garlic salsa and optional oregano and baby portabella mushrooms. Add fresh ground pepper, serve immediately. Use damp paper towel to brush mushrooms clean. 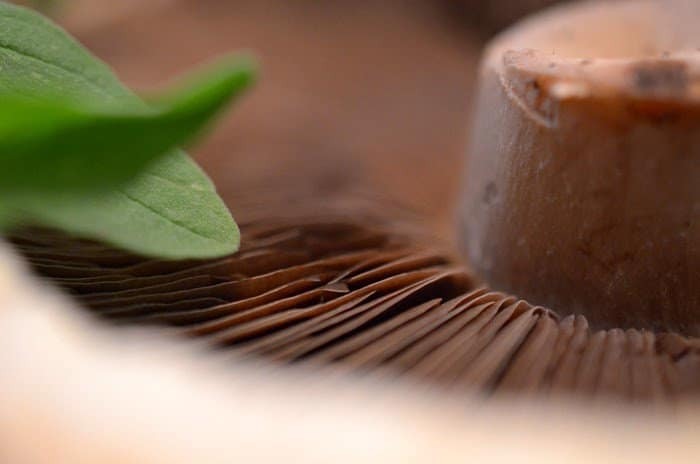 Avoid rinsing with water as the mushrooms will absorb the liquid and be mushy. Such a beautiful and healthy breakfast! I love kale with eggs. Oh wow!!! I would soooo Love to have this for Sunday Brunch!!! Yum! Thanks, Deanna; I think you would love this for brunch! This looks heavenly good! 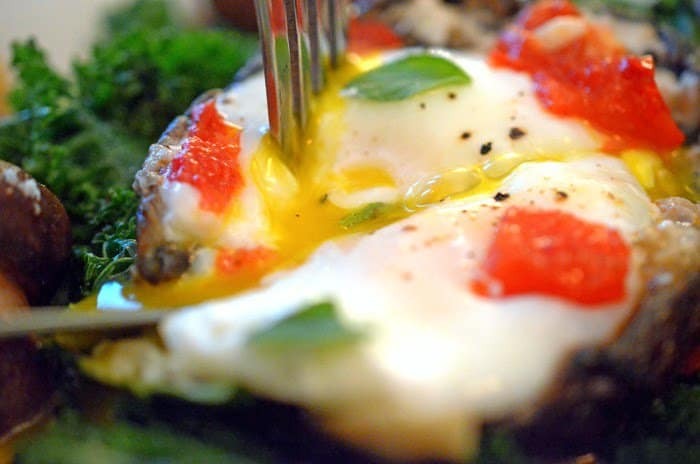 I love eggs and am always on the lookout for new recipes! This is such a cool breakfast. 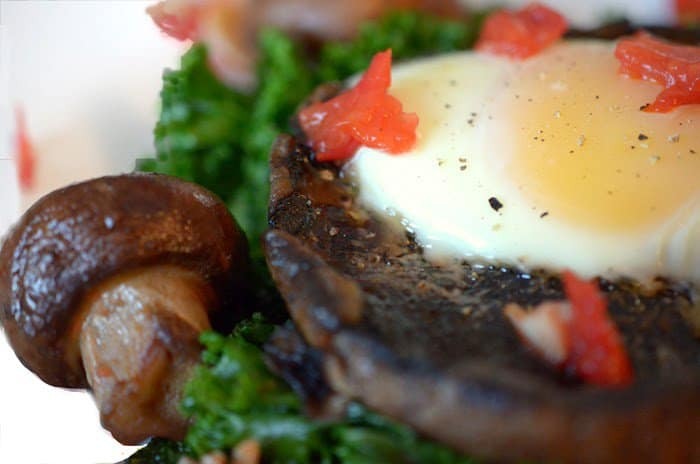 I love Portabella mushrooms… Must try this next weekend. Thanks, we certainly enjoyed it! I’m always up for a new portobello recipe! This looks fab! I’m only a ‘sometimes’ kale fan, but I’d give this a shot. Or I’d use spinach. Either way– the baked egg is clever and the photos are gorgeous! Looks like the perfect brunch or weeknight dinner to me! This is a fabulous idea! 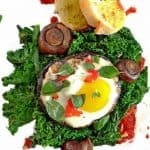 I love hearty breakfast dishes, and this sounds right up my alley. 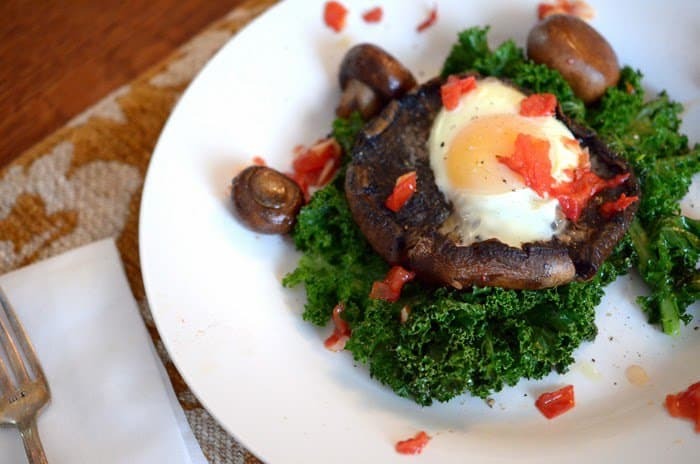 Those portabella mushrooms are like the perfect little nest for the eggs! 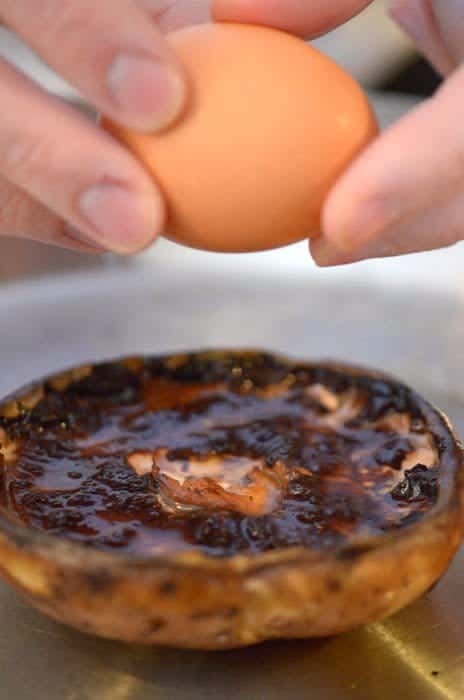 Really really really like the idea of using a Portobello mushroom as the cup for a baked egg. Bookmarking! I wish I was having this for breakfast this morning, what a delicious dish. 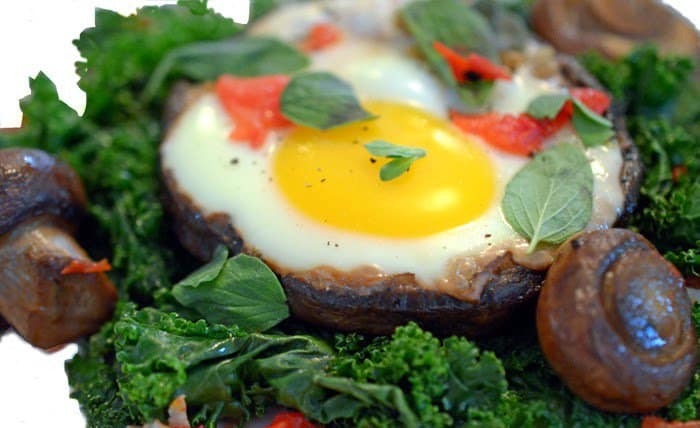 We also love cooking our egg inside the mushroom cup. Delicious! I love the addition of the kale for some extra goodness. 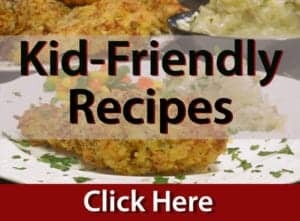 What an absolutely fun and amazing recipe! I must try it soon! What a genius idea! 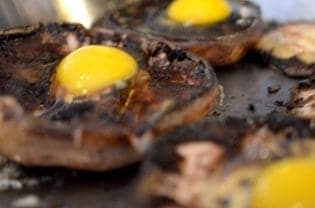 Love the portabellas cooked with the egg in the center- YUMMY indeed! Happy you like, this really is delicious! Thanks for the great comments! G’day! This looks gorgeous Dan! A vegetarian’s food dream! Joanne, Thanks for stopping in, would love to serve you up a plate of this! Have a great weekend! This is such an elegant, easy and colorful dish, Dan! Love all those fresh springtime flavors together. This is a must-try! Thanks, Georgia! We are determined to bring some sunshine into our lives, one way or another! FANTASTIC, that looks so wonderful! I enjoyed this blog post , it is something I can actually see myself eating! 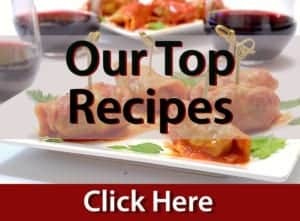 The recipes seems easily to follow and quick to make! Thank you, Heidy! It’s so fun to put such color and flavor together in the kitchen. I’m glad you enjoyed this one!